A few drills from Drew Hanlen, Founder of Pure Sweat Basketball to work with your players on being strong and tough with the basketball while dribbling. 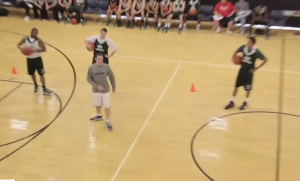 The drills are a sample from his Pure Sweat Basketball Skill Development Video. The video is 74 minutes long and contains over 150 concepts and drills to improve the skills of your players. Click the link to find out how you can stream the video to any of your devices: Pure Sweat Skill Development Video. This is a vimeo video, so make sure that you are able to access that network. Also, please make sure your sound is on for the instruction with the video.